Ancient myths claim that solar eclipses can be bad omens. For catcher Daulton Varsho, last week's spectacle was anything but. The D-backs' No. 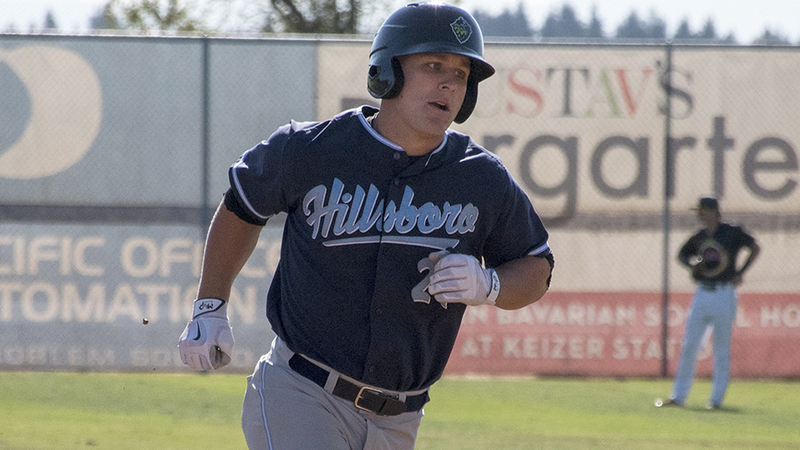 16 prospect won Northwest League Player of the Week after going 10-for-20 (.500) with three homers, one triple, four doubles, seven RBIs and seven runs scored over five games for Class A Short Season Hillsboro. His eight extra-base hits were tied for the most among all Minor Leaguers for Aug. 21-27, while his 25 total bases ranked third -- despite the fact that he played in only five of the Hops' seven contests in that span. Varsho's biggest performance came last Monday for a game at Salem-Keizer that was already going to be special. The game started at 9:51 a.m. local time to incorporate affiliated baseball's first-ever eclipse delay as Volcanoes Stadium sat within the path of totality. Before the moon passed in front of the sun, the lefty-swinging slugger ripped a two-run homer to left field off Salem-Keizer right-hander John Timmins in the first inning. The 58-minute eclipse delay commenced after the top of the first, and Varsho went deep again to lead off the sixth, this time off righty Peter Lannoo, for his first career two-homer game. "It was pretty cool that we go to chill and stay out on the field during the delay," Varsho said. "But yeah, at the same time, you need to keep locked in and not get too caught up in what was going on. That first inning, I think we all had good at-bats, and that made us all really relaxed and calm. It was pretty funny to wear the glasses though, and the crowd was great for the whole thing." The 21-year-old didn't slow down as the week wore on, collecting at least one hit in his next four games, including three on Tuesday and two on Sunday. His double at home against Tri-City on Saturday gave him 25 extra-base hits this season, setting a Hillsboro single-season franchise record in the category. Taken 68th overall in this year's Draft, the University of Wisconsin-Milwaukee product has transitioned well to the pro ranks, hitting .320/.368/.545 with six homers, three triples, 16 doubles and seven stolen bases in 45 games. His .913 OPS is tops among Northwest League hitters, including fellow top D-backs picks Pavin Smith (.852) and Drew Ellis (.700). To see Varsho succeed with the bat is not a huge surprise. The Wisconsin native was the first college catcher taken in this year's Draft after producing a .362/.490/.643 line with 11 homers in 54 games as a junior. But he said this run is the best he's felt since a 2016 summer campaign with the Eau Claire Express in the Northwoods League, where he batted .321/.427/.587 with 15 homers. "I've been trying to keep things as simple as I can," he said. "I've opened up my stride a little bit, but really what I've been trying to do is make hard contact every time I'm up there. This is the best I've felt since that sophomore summer. ... I went over film a couple weeks ago from that time, trying to see what was working for me then, and things have started to click. It's a fun feeling." Varsho received his lowest scouting grades for his defensive work, particularly his arm, which MLB.com gave a 40 on the 20-80 scouting scale. Even that, however, has been solid as the 5-foot-10 backstop has thrown out 32.3 percent of attempted basestealers, just below the league average of 33.3. Varsho and his teammates have already earned a spot in the Northwest League postseason after winning the South Division first-half title, but they have a chance to sweep with a two-game lead over Eugene and only six games left to play. A member of the Northwest League mid-season All-Star team who's likely headed toward a spot on the end-of-season All-Star roster as well, he's relishing the opportunity to add a league title to his resume. "This will be really the first championship I've ever played for," he said. "My school didn't really have a big conference tournament, and we never reached the regional or anything like that. So this will be a lot of fun to play for a big trophy like this, and it'll be a lot of fun to have Hillsboro behind us doing it, too."